The Illinois Lottery is bringing audiences a great line-up of concerts this summer in the Anything's Possible Music Series - everyone from Jack Johnson to Rascal Flats to Bruno Mars to Jimmy Buffett to Aerosmith and many, many more. This past week I attended my third concert this season at First Midwest Bank Theatre this year. 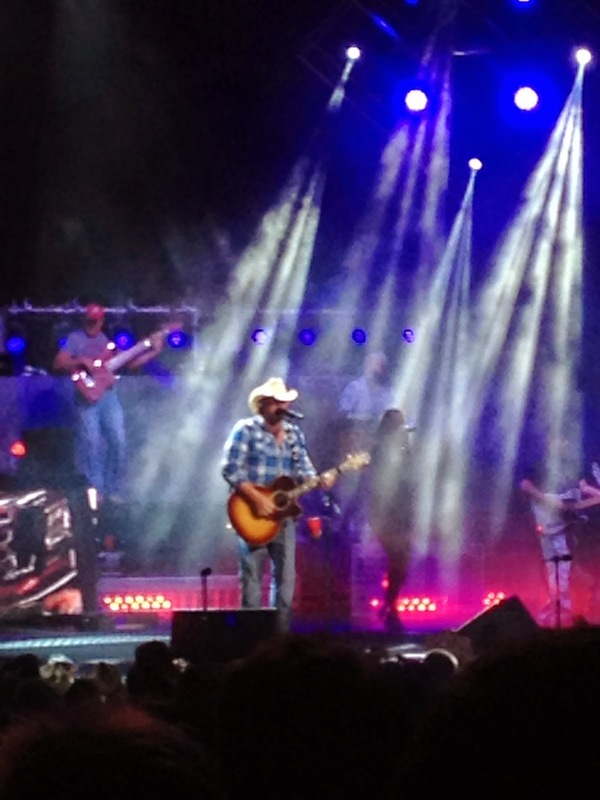 The first two were country shows - Brad Paisley and Toby Keith. This most recent concert was a big dose of old school rock and roll with Lynyrd Skynrd and Bad Company. 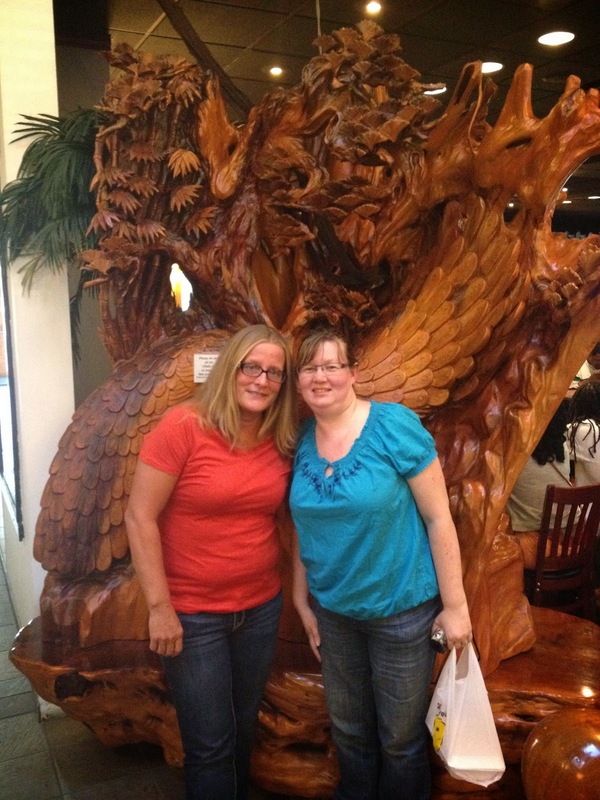 I attended with my sister-in-law and we stopped for a pre-show dinner at Hamada of Japan, which is just a couple minutes down the road where we stuffed ourselves on noodles and rice and veggies, meat and seafood cooked right in front of us. I totally recommend it for a concert night dinner. We watched the show from the Illinois Lottery VIP deck - a nice vantage point. First up was Lynyrd Skynyrd, followed by Bad Company. A lot of the music from both bands was released when I was a toddler, but I'm a sucker for classics and oldies. I didn't realize until I looked up some song lists for each band how many of their songs I knew. There were some great old school classic rock songs on the list that I knew and loved, but didn't realize who the artists were. I was very excited to see Lynyrd Skynyrd. As far as I'm concerned Sweet Home Alabama is at the top of the list of all time best rock anthems. I've always loved the song and then when Kid Rock added it in to a mash up with his hit All Summer Long, I loved it even more. I saw Kid Rock at Soldier Field a few years ago when he opened for Bon Jovi. I went there not really into him, but he totally won me over with his performance, especially when he sang All Summer Long. Anyway, it was a blast being there to see Lynyrd Skynyrd sing one of the best ever rock anthems live. It wasn't until I saw the movie Con Air (remember that scene where the song Sweet Home Alabama plays as John Buschemi explains the definition of irony?) that I learned that three members of the group died in a plane crash in the late 1970's. The group now tours with a re-formed band that includes couple of original members and the younger brother of the original lead vocalist filling his brother's shoes. So, the show then went from the deep south to the English band Bad Company (I adore British musicians and singers), which had a big string of hits in the 70's that produced some disco-era baby making ballads, like Feel Like Makin' Love and Ready For Love and some good nitty gritty rock tunes like Can't Get Enough, Bad Company and Good Lovin Gone Bad. It was a fun night. Thanks to the Illinois Lottery for providing tickets as part of the Anything's Possible Music Series (a cool slogan to remind you that the sky is the limit if you are a winner.) You can pick up Anything's Possible scratch off tickets where Illinois lottery tickets are sold and you can win up to $1,000. Tickets are also available at some of the upcoming concerts. More on the #apmusicseries here where you can also enter the Anything's Possible Music Series sweepstakes to win concert tickets and meet and greet passes! I recently had a work trip scheduled up in Benton Harbor, Michigan. Hubby and the boys decided to drive up with me and have some fun while I was in meetings. They went cherry picking and then to lunch and to a cider mill and for a drive by the lake. At the end of the day, I requested a stop at the beach since I'd been inside all day while they were having fun. For so many years I avoided beached simply because I didn't want the mess of the sand everywhere. It does get absolutely everywhere - in your clothing and you shoes and your towels and then you car and you find it at home in your bed and your sofa. I'm glad I finally got over that aversion to sand. I'd be missing so much! So, despite the fact that we'd driven my new car there, I sucked it up and decided to deal with the sand and I'm so glad I did. Here's what things looked like at the beach that day in St. Joseph, Michigan. 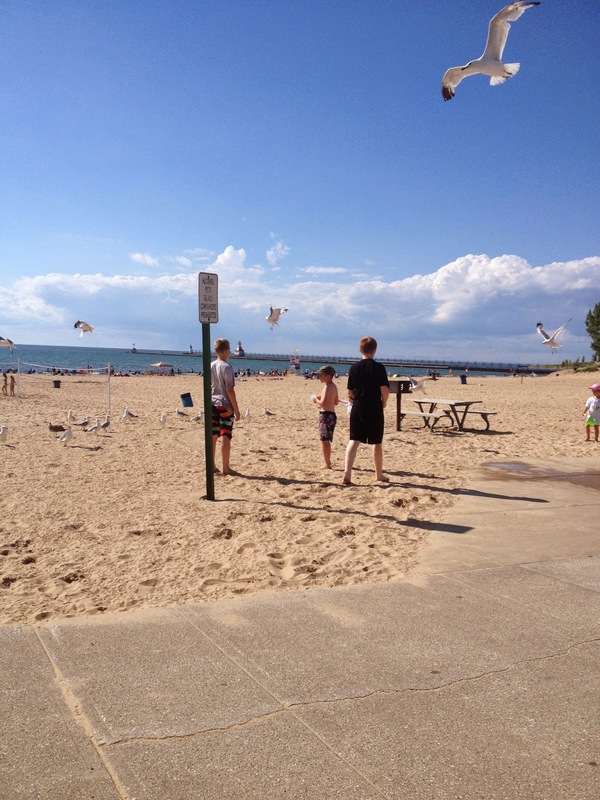 The boys had fun feeding crackers to the gulls. 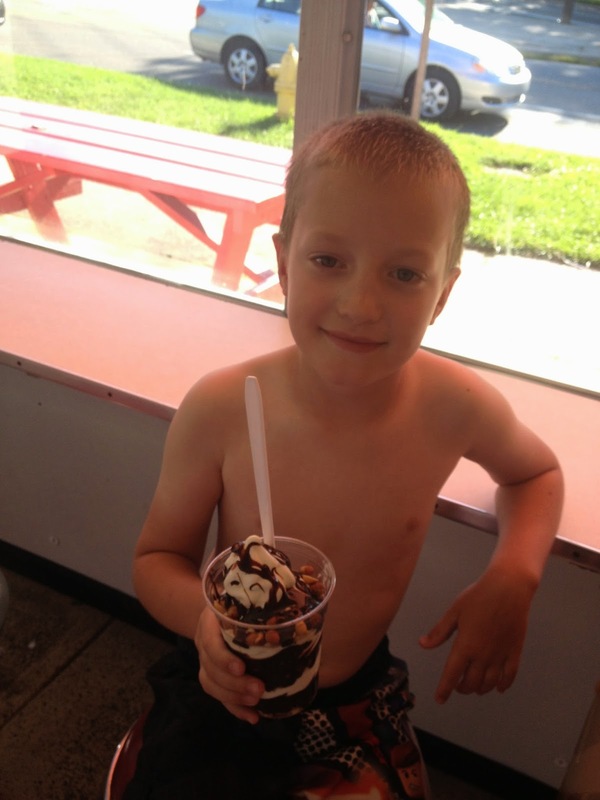 Then we spotted an ice cream stand on our way out of town and couldn't pass it up. And then we stopped one more time on our way out of town at Lookout Park so I could take a couple pictures. What a peaceful place. My middle boy is 12. This past spring he joined the local Civil Air Patrol chapter. Being a child who loves structure and schedules and routines and doing things by the book and playing by the rules he took well to it. He liked how they marched in formation and did drills and wore uniforms according to specific guidelines. The CAP program is a cadet program of the Air Force, so it gives the cadets a little bit of a taste of what life is like in the military. So far, he has loved it. This summer he had a chance to go with the group to an encampment on an active military base in Southern Indiana. At first I wasn't sure how he would do with it. He's only 12. I can count on one hand the times he has spent the night somewhere other than home. All but one were at his grandparent's house. The other was when he was about 9. He went to spend the night at a friend's house on New Year's Eve. About 10:30, we got a call from him that he wanted to come home. But, he's older now. He's gotten to know the kids in the group. So, he left on a Friday afternoon with his dad driving him and a few other cadets to the base. Dad came home with my son's phone. He wouldn't be able to use it on the base. It's been hard not being able to talk to him for several days. There is a website for the camp and three days in I got a glimpse of him in a photo. That in itself was a little shocking. He hates having his picture taken. And he's been very ambivalent about going up in an airplane despite being in the Civil AIR Patrol. But there he was in the photo standing in front of a plane with a certificate in his hand indicating he had flown. He was giving a thumbs up and had a little smile on his face. It was so nice to see that image of him. Camp will soon be done and he'll be back home. I can't wait to hear about it. 9 days away from home I'm sure will have an impact on him. I've missed him, but I'm so thankful he's had this opportunity to experience life away from home doing something he enjoys. I was not one of these adolescents or teenagers who went to concerts. As much as I would have loved to, I just never had an opportunity to go to one. There were some pretty awesome artists touring when I was growing up in the 1980's. I can imagine how awesome it would have been to see Madonna, Michael Jackson or Prince. I was 19 years old before I went to my first concert and it wasn't a rock concert. It was a country singer, Travis Tritt. An evening of watching him perform in the intimate Park West venue and I was hooked. Ever since then I've loved attending concerts and have been to way more than I can count. My first concert at a big venue was Garth Brooks at the World Music Center, which was then the Tweeter Center and is now First Midwest Bank Amphitheater. 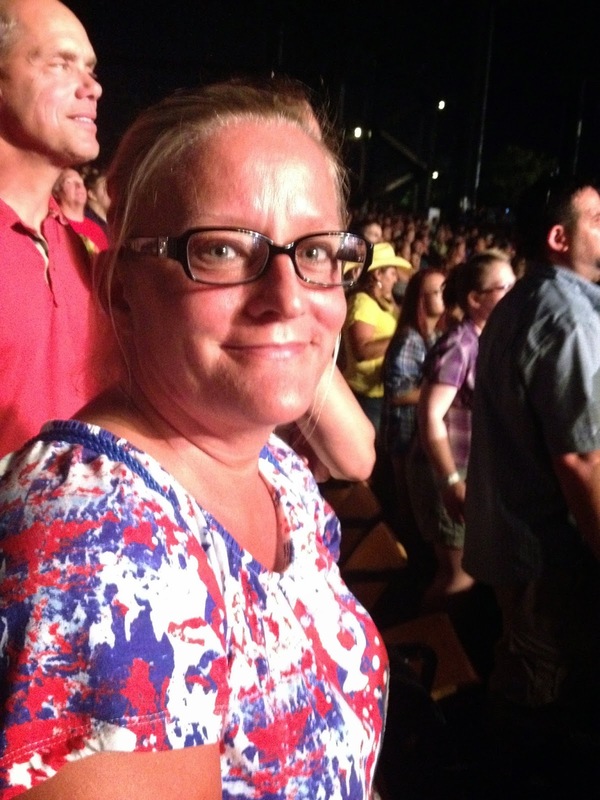 A group of us went to the show, including my sister-in-law, Sherry. It was 1992. We watched from the lawn seats. Well, a lot has happened since 1992. I've had 5 kids. Sherry's kids are all adults. 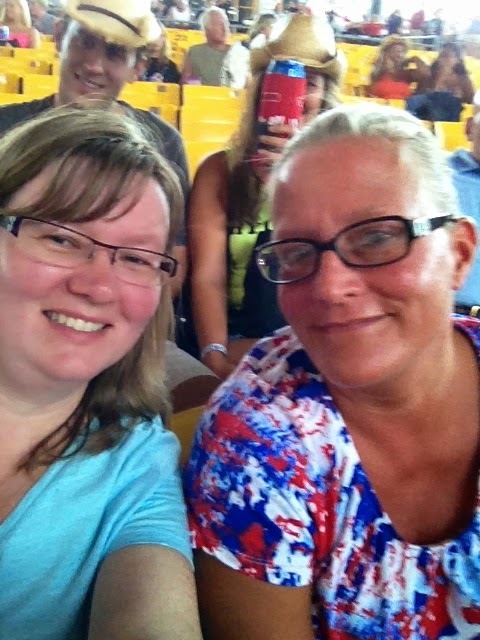 But we both still love concerts and country music, so this summer we decided we'd go see Toby Keith's show at the First Midwest Bank Amphitheater. My summer just isn't complete until I've been to an outdoor concert at the First Midwest Bank Amphitheater - and there's always more than one. The day before the concert there was some nasty weather. Huge downpours flooded the lots at the concert venue and a Journey concert had to be cancelled. Luckily, enough of the water had dried up the next morning for Toby's show to go on. We headed to Tinley Park and crossed our fingers for good weather. We stopped on the way for dinner and martinis at Gatto's Italian Restaurant. I also write a food blog, (Chicago Foodie Sisters - www.chicagofoodiesisters.blogspot.com) so I'm always looking for new places to dine and this one was new to me. We then went over for the show and I took her on my secret route (well, not really secret, just much less traveled road than the one leading to the big parking lot) and we were there in just a few minutes. Toby Keith's gorgeous daughter Krystale Keith was on stage and she has got some pipes on her. Up next was Colt Ford singing some country rap. Not exactly my thing, but you could tell he was having a blast up there on stage and how could you not love watching that? As Colt Ford finished up, I went out seeking nachos and saw the Illinois Lottery tent. I'd applied through a blogger program for their "Anything's Possible" Music Tour to attend the event and blog about it. Unfortunately I wasn't picked as a blogger for this concert and we purchased tickets and attended on our own, but I stopped at the tent and they had a pretty cool set-up with some nice gifts if you purchased $5 in lottery tickets. I talked to the staff to see if any other bloggers had cancelled and if I could possibly get into the lottery section for the show. We were escorted there, but just after we walked up on deck, it started pouring down rain. Since we were getting soaked, we realized we were better off back in our regular seats. So we hung in the lottery section for about five minutes, took this picture and then went and sat back down in section 104. We had pretty good seats and enjoyed Toby's show. We decided in recent years that if we were going to a concert we needed to bite the bullet and buy pavilioin seats. The days of hanging in the lawn are behind us. Toby didn't disappoint. He always puts on a good show. This was my third time seeing him in concert. As I watched him sing "I'm Not As Young As I Once Was," I thought of my friend, Fran, who went with me to see him in concert at the First Midwest Bank Amphitheatre about 5 or 6 years ago. She loved country music and we'd go to a lot of concerts together. Fran passed away last month at the age of 80, so it was quite bittersweet. Toby is known for his patriotic anthems and at each show I've been to he has ended it with his songs touting the good 'ol USA and has had military personnel in uniform join him up on stage. It's always special and a little emotional, this time even moreso since Sherry's two sons, my nephews, James and Jeff, are in the military. One is in the Marines and the other in the National Guard. So here's a peek at the grand finale. - Lawn seats in the rain. Who cares? - Hang out in the parking lot following the show. No one's moving. Who cares? - Dinner before the show. - Seats in the pavilion so we don't have to sit on the lawn in the rain. - Plan for fastest route out of parking lot so we don't have to hang out in parking lot. - Yawn as we make our way out of the parking lot. As Toby sang, "I'm not as good as I once was." :) But that won't keep us from having fun at concerts. I'm hoping I'll get a chance to attend some other concerts this season as part of the Illinois Lottery Anything's Possible blogger team. This was my second concert at the venue this season and I'm ready for more. Hoping the next one will be some classic 80's rock with one of my boys.